I’ve often referred to myself as a mad scientist with art supplies, and that certainly is true lately. 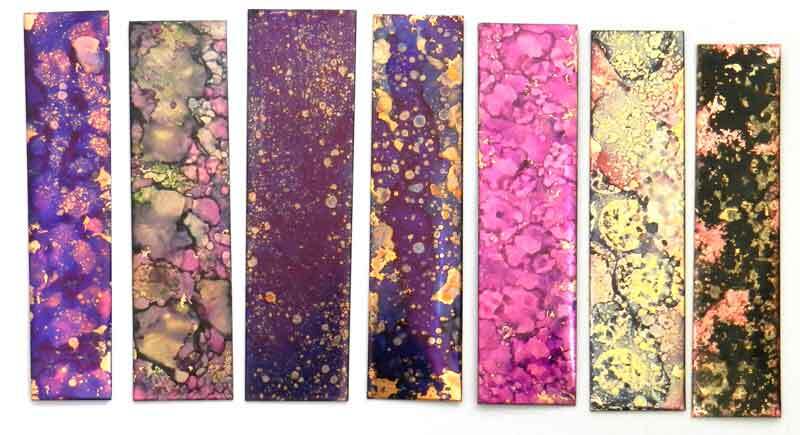 For several years now I’ve been doing a series of experiments with color on metal using alcohol inks, chemical patinas, heat, and more. Now I’m sharing the info and insights in classes–and here in this blog! 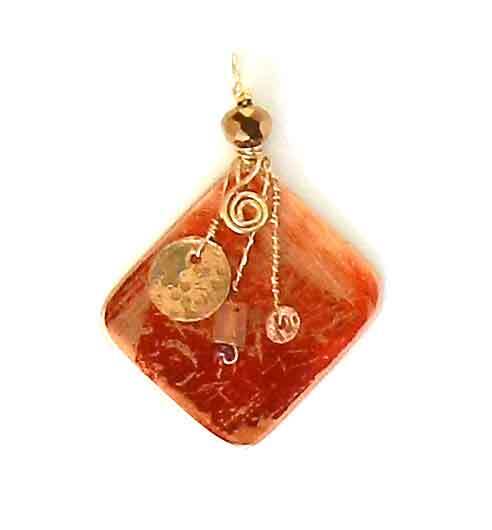 I will be holding classes at Tinkermill in Longmont, Colorado, and Gahanna Bead Studio in Gahanna, Ohio. I’m booking the times this week for Spring, and getting ready with samples and handouts. 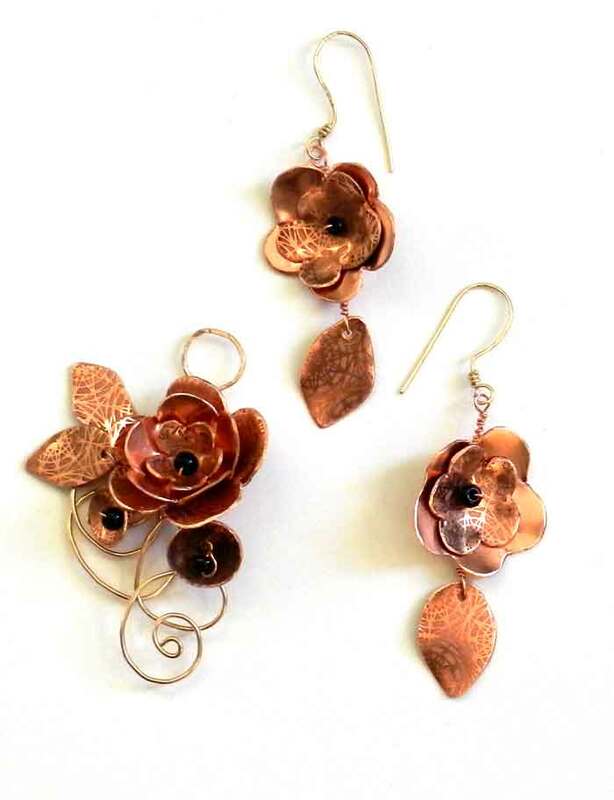 There will be two classes in Electrical Etching, one for Etched Bangles and Beads and using wire and sheet metal in making Etched Jewelry Components. 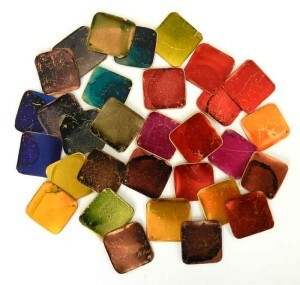 Color on Metal Part One will cover alcohol inks on brass or copper, exploring a great number of decorative techniques while Color on Metal Part Two uses chemical patinas and heat to create color on brass, bronze, copper and nickle silver. 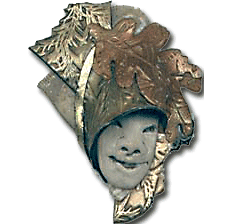 Also coming up for Spring is Metal in Bloom. 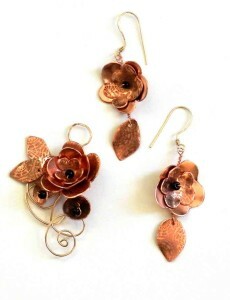 Using a few beads, wire, sheet copper and brass, we will create flowers with hand tools available in the studio. In the course of preparing samples, I cut up sheets of 24 gauge brass and copper into 3 inch squares. It is a good thickness for making pendants and earrings, and lightweight cuff bracelets. Not too thick for hand cutting and punching, it is a good weight for experimenting. Not so thick that it is hard to work with hand cutters and punches, and not so lightweight that I can’t use the pieces for jewelry if experiments go well! Some squares I left at that size, some I cut into 1×3 inch strips and some into 1 inch squares. 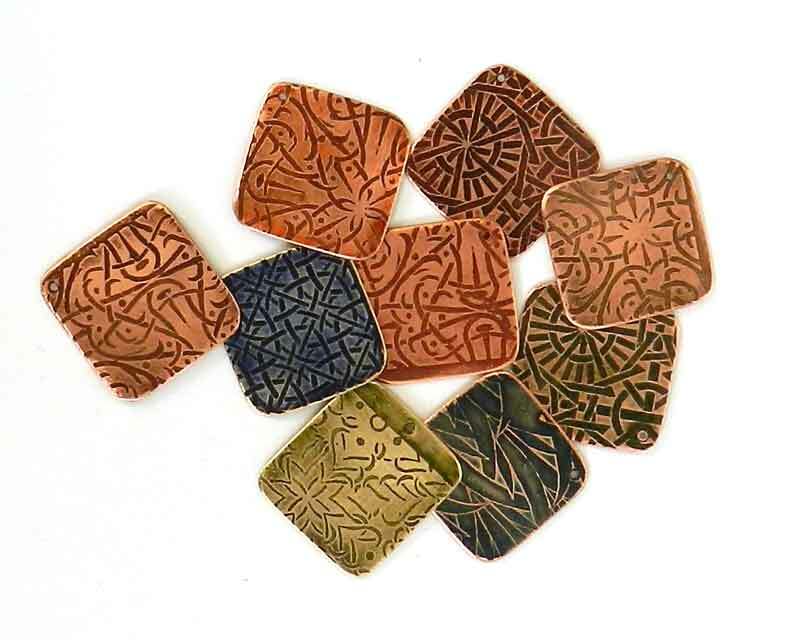 Some of those were plain, and some etched, and I used them first to create some test squares. I tried one drop, then another drop further over, of all the colors of Ranger Adirondack Alcohol inks that I had on hand. Then I borrowed more from my friend…then bought a few colors I HAD to have like indigo and citrus, and the blender as well. I tried the blender and alcohol both, and both are good in different ways. I decided after experimenting with my friend’s bottle that I needed some too. The dropper squares were carried around in a metal box with other pieces and proved that indeed sharp un-filed edges will scratch the color if you keep them in a big moving pile. So don’t do that–although, I decided I like the distressed look. Lets call it “scrafitto” and say we meant to do that. I used a square to try a different wire wrapping technique and like it.I may do a few more, and I will subject some to other tests–do check back to see what all I discover!